At the world-renowned Jetwing Yala and Jetwing Tented Villas, you will be fully immersed in the magic that is the wild of south-western Sri Lanka. Located barely ten minutes from the gates of the Yala National Park, the properties are designed to allow guests to embrace the natural wonders of the region while basking in the luxury experience that Jetwing offers. In addition to the variety of amenities it offers, Jetwing boasts a tremendous commitment to sustainability and the environment. Jetwing Yala hosts one of the island’s largest privately-owned solar parks. This, coupled with responsible wildlife tourism under the guidance of Jetwing’s expert naturalists, ensures that your stay in the wild has a memorable, positive impact. With 80 rooms built to seamlessly blend into the surroundings, spending time in the resort premises allows you to fully soak in the natural terrain while sampling the comforts of a luxury stay. Featuring three bars – in the lobby, by the pool and by the sea – alongside an international dining and a fusion dining restaurant, Jetwing Yala spoils its guests with the finest dining opportunities featuring dishes created with care by expert chefs. 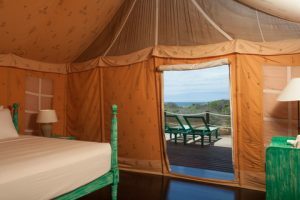 If you are an outdoor enthusiast the glamping experience at Jetwing Tented Villas in essence has the best location in view of the endless seas, the majestic star studded sky, and few visitors from the animal kingdom. The fully-fledged 10 decked luxurious villas come with butler service and packages inclusive of unlimited supply of beer and safari packages to the Yala National Park. The guests can choose from the many dining options be it by the beach or bonfire or on the deck, the Jetwing Tented Villas are a private enclosure closer to the natural world. The beachfront area is staffed by internationally trained lifeguards and guests can enjoy dips in the warm sea all year round, though this area of the island is at its finest between the months of October through May. The sand dunes of the seashore make the perfect setting for a romantic dinner under the stars, with the ocean a few feet away; this unforgettable dune dining experience can be arranged through the dedicated hotel associates. A visit to this region would be incomplete without a thrilling safari in the Yala National Park, brimming with wondrous flora and fauna – an album of memories to last a lifetime. Committed Jetwing naturalists ensure that your experience in the park is both adventurous and educational, as you learn about all the majestic creatures that you see. The region is also rich with religious history – the temples at Tissamaharama, Kirinda, Sithulpawwa are beautifully set in the rough landscape. The shrines at Kataragama, just over an hour’s journey from the hotel, draw devotees of all faiths from across the island to the multi-cultural places of worship. For more information or reservations please call on 011 4 709 400 or e-mail onresv.yala@jetwinghotels.com. To enjoy discounts at the properties log on to special offers on www.jetwinghotels.com. Family owned and in the tourism industry for the past 43 years, Jetwing Hotels has surpassed expectation at every aspect. Building on their foundation of being passionate, as well as the experience of true, traditional Sri Lankan hospitality, constantly pioneering discoveries captures the essence of the brand. Such a strong statement and direction have enabled Jetwing Hotels to imagine, create and manage marvels and masterpieces, where distinctive design and elegant comfort complement each other and the environment. In line with the Jetwing Hotels Sustainable Strategy, across all properties sustainable and responsible practices are given precedence with resource efficiency, community upliftment and education, and awareness being some of our key focus areas.